Anu Aga is Director on the Board of Thermax Limited, the engineering company providing systems and solutions in the areas of energy and environment. She retired as Chairperson of Thermax in October 2004. She began her industry career in Thermax in 1985 and later was in charge of the company’s Human Resources function from 1991 to 1996. 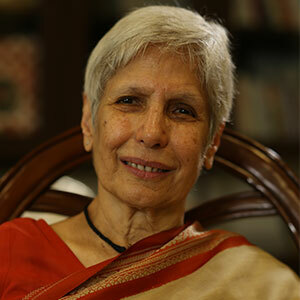 After her husband Rohinton Aga passed away, she took over as Executive Chairperson of the Thermax Group in February 1996, and two years later chose to continue as Non-Executive Chairperson. As Chairperson, Ms. Aga anchored the turnaround of Thermax through four major initiatives: reconstitution of the board, shedding of non-core activities, rightsizing of operations and increased focus on the customer. She is also instrumental in driving a high performance culture at Thermax. Since her retirement, Mrs. Aga has been focusing on social causes and is closely associated with the Thermax Foundation. Her area of interest is Education and she is keenly involved with an NGO called Akanksha, which promotes education for underprivileged children in Mumbai and Pune. The Foundation, in partnership with the Municipal Corporations of Pune and Pimpri Chinchwad and Akanksha is managing five schools for children from lower income groups. Mrs. Aga is the chair on the Board of ‘Teach for India’ which attempts to bridge the inequity gap in education and is actively involved with its initiatives. Ms. Aga has been very active in various national and local associations like Confederation of Indian Industries (CII) and had served as the Chairperson of CII’s Western Region. She has written extensively and given talks on the subjects of corporate governance, corporate social responsibility, role of women and education.